Pastor Zamzow grew up in Antigo, Wisconsin where he attended Antigo Public High School. Right after high school, he attended Wisconsin Lutheran College for 1 year with the intent to be a history teacher. During that year he became motivated to pursue the pastoral ministry and went to Martin Luther College in New Ulm, MN. This only lasted for one semester because he was young and impetuous. Pastor Zamzow also is passionate about music. At that time, he and some friends had a 3 piece acoustic rock band back in his home town. He was torn between ministry and music and at that point the rock and roll won out. After 6 years of professionally touring, recording and running a stage at the worlds largest music festival (Summerfest in Milwaukee, WI) he decided to return to MLC and finish what he started. He graduated from MLC in 2014 and began studying at Wisconsin Lutheran Seminary that fall. 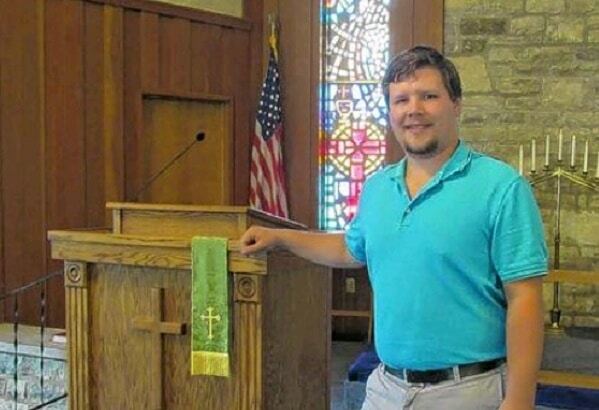 He spent his vicar year (pastoral internship) in Grove City Ohio at Beautiful Savior Lutheran Church. Then in May of 2018 Pastor Zamzow graduated from Wisconsin Lutheran Seminary with a Master of Divinity. Pastor is married to his college sweetheart Marina. They were married the year before seminary started. They now have 2 children Otto and Ivana – as well as their cat Marlee. Personally, Pastor Z enjoys various intellectual pursuits like the study of ancient history. Away from the desk, he likes fast cars, hiking, fishing, hunting and trying to golf. Most of all Pastor wants to reach people with the gospel message by showing them who Jesus is in the Bible.